TS Employees Transfers Schedule 2018 –Transfer Application Form, Guidelines Rules GO 61. Telangana Employees Transfers Guidelines, Schedule 2018 released TS Government on 24th May, 2018. 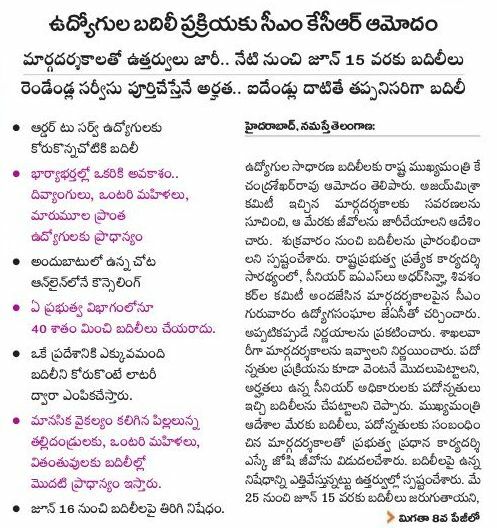 Telangana Employees Transfers Guidelines, Transfers Application form Apply Schedule from 25th May, 2018 to 15th June, 2018, Transfers Procedure, Qualifying Service and Eligibility Criteria, TS Employees Transfers Schedule, TS Employees Transfers Rules. 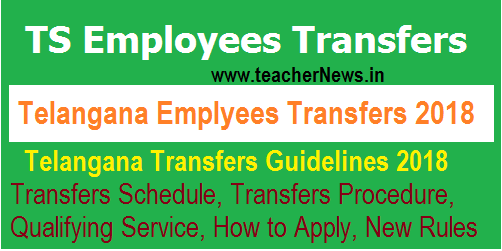 Telangana Employees Transfers Guidelines 2018 Released. Government of Telangana has released the Transfers Guidelines for Telangana Employees for 2018.Details of the Orders of the Telangana Employees Transfers Apply Dates, Guidelines, Rules GO 61 Dt. 24.05.2018. Telangana Employees Transfers 2018 Guidelines, Rules Released. TS finance department released G.O.Ms.No.61, Dated:24.05.2018 (TS Employees Transfers) lifting ban the transfers shall be made from 25th May 2018 to 15th June 2018 as per the schedule is shown in the Annexure-I. The ban on transfers shall come into force with effect from 16th June 2018. The government in the reference first read above-issued orders imposing a ban on all transfers except in respect of some instances referred therein. In the reference second read above, Government constituted a Committee of senior officers under the Chairmanship of Sri Ajay Misra, IAS. Special Chief Secretary to Government, Energy Department to formulate the “Transfer Guidelines” for all categories of employees, in consultation with the concerned stakeholders, with a direction to submit their recommendation for employees’ transfers, including Teachers, to Government. The Government, after careful consideration, hereby relax the ban on transfers imposed, vide reference first read above, for the period from 25th May 2018 to 15th June 2018. The HoDs and Competent Authorities shall follow the following guidelines while effecting transfer of employees. ప్రభుత్వ ఉద్యోగుల బదిలీలపై నిషేధం ఎత్తివేస్తూ రాష్ట్ర ఆర్థిక శాఖ గురువారం GO 61 ఉత్తర్వులు జారీ చేసింది. ఉద్యోగుల సాధారణ బదిలీల షెడ్యూల్ను విడుదల చేసింది. ఆన్లైన్ కౌన్సిలింగ్ ద్వారా మే 25 నుంచి జూన్ 15 మధ్య ఉద్యోగుల సాధారణ బదిలీలు ఉంటాయి. జూన్ 16 నుంచి సాధారణ బదిలీలపై మళ్లీ నిషేధం అమల్లోకి రానుంది. బదిలీల శాతాన్ని 40 శాతానికి పెంచారు. The transfers shall be made from 25th May 2018 to 15th June 2018 as per the schedule is shown in the Annexure-I. The ban on transfers shall come into force with effect from 16th June 2018.
iv. The Competent Authority may obtain up to five options for preferential places of transfers from the employees in the prescribed proforma in Annexure-II. However, the Departments may modify the proforma according to their specific requirements. VI. In case, adequate personnel does not opt for hardship area, the system of the lottery shall be followed for effecting transfers. VII. Counseling shall transparently do all transfers. Wherever possible, advice will be done on the online/web-based application. b) The revenue earning departments viz. b) Prohibition & Excise Department and c) Stamps & Registration Departments shall follow the separate guidelines issued in the G.O.Ms.No.143, Finance (W&M)Department, dt.21-06-2007. The Transport Department and Forest Department shall make the general transfers as per the guidelines issued in G.O.Ms.No.147, TR&B (Ser.IV) Department, dated. 12-06-2007 and G.O.Ms.No.81, EFS&T (For.V) Department, dated.08-07-2008, respectively. Similarly the Police Department shall frame specific guidelines for transfer of police personnel separately. TS Employees Transfers Schedule 2018 –Transfer Application Form, Guidelines Rules GO 61.Transfers Application form Apply Schedule from 25th May, 2018 to 15th June, 2018.